So you’ve finally decided to splash out on new sailing instruments, and all that remains is the how and where of installing them. That is not necessarily as simple as it seems. There is a number of things to be taken into account. The best place for speed, depth and wind displays is where the entire crew can see them. In many older boats—my own included—the builders (and, later, owners who retrofitted instruments) saw fit to place the displays where it was most convenient for them to do so. This was (and is) usually where they could be installed with the minimum of fuss and extra work. Hence the vast number of boats with speed/depth and often wind displays on the cockpit bulkhead, right where lounging crew tends to block them. I’ve lost count of the times I’ve had to ask someone to move so I can see the depth display. Since lines are often led aft to winches on either side of the hatchway, maneuvers like reefing and trimming are also often carried out in this area. It’s not unknown for a careless knee to shatter a display. It may seem logical to mount your new displays right where the previous ones were—after all, you can often make use of existing cut-outs, especially if the new instruments slot right in—but it may be even more logical to seize the opportunity to install them in a better location. But where? 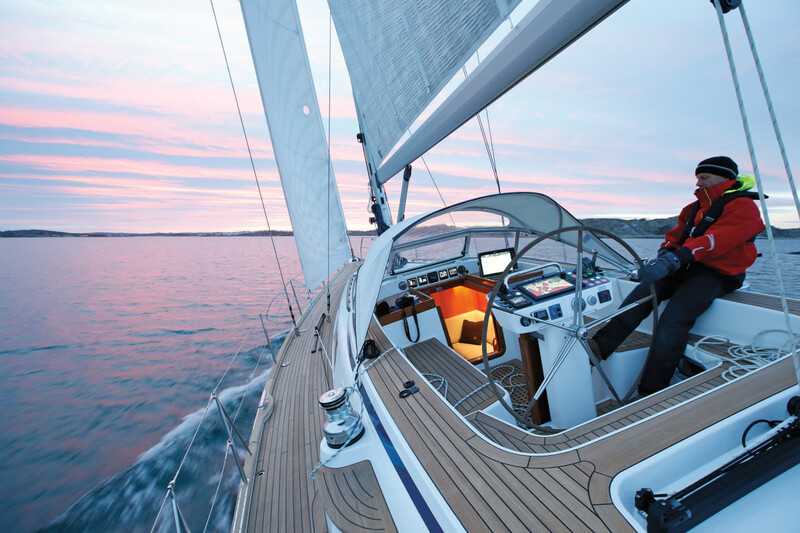 As boat designers and builders began to take instrument location into consideration, so the aftermarket industry followed with a number of new options for displays. One of the most popular was—and remains so—at the helm station. Steering-gear makers produce good-looking and well-finished pedestals that can accommodate several flush-mounted displays, and several companies make attractive instrument housings that can be attached to pedestal guards. 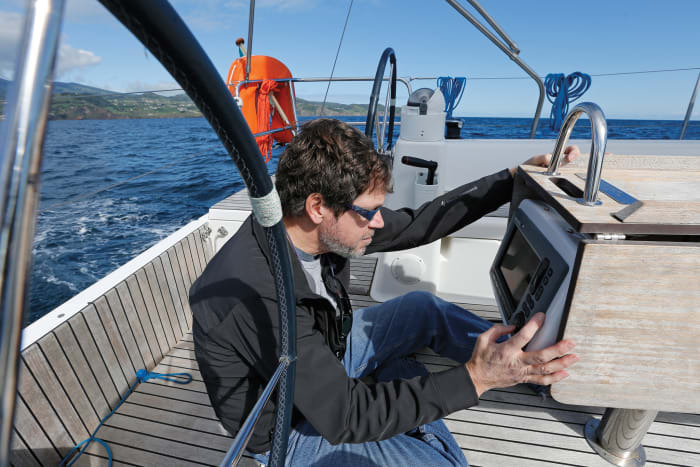 The binnacle is also the logical place to mount a chartplotter or multifunction display; these belong above deck, not down below, and the helmsman needs easy access to its plotting functions. With the instrument readouts concentrated in one place, the helmsman’s view of them can never be blocked. However, no one else can see the displays, nor can the driver should he or she want to leave the helm while the autopilot steers—which, when you are passagemaking, is most of the time. For this reason alone, many sailors do not want instruments that can’t be seen or accessed except by someone standing behind the helm. The exception is the autopilot control which needs to be by the wheel. The same goes for an MFD, though these admittedly are harder to find a home for. How many times have you seen a plotter perched so high on a pedestal guard that the helmsperson has to look around or over it? Having such a large display so close can be distracting and annoying. If you can’t flush-mount the MFD in the pedestal, the answer is to mount it in a swiveling pod affixed to the pedestal or pedestal guard. On smaller tiller-steered boats or older designs where the wheel is well forward in the cockpit, a swing-out mount inside the companionway may be the way to go. Most modern production boats now have twin wheels, which, combined with the efforts of stylists looking for clean, unbroken lines at the expense of functionality, results in some inventive and often odd instrument locations. You’ll often see MFDs and compasses mounted in the aft face of a cockpit table, where the helmsman sometimes has to crouch to see them. They may also be bolted to the top of a table, where they are in the way but easier to see or, on bigger, more expensive boats, at each steering pedestal. Sometimes instruments are doubled up with displays at either wheel or tucked away wherever the builder can find a place for them—often recessed into the cockpit coamings at the helm stations. On some boats, there are no sailing instrument displays at all—the MFD serves that purpose. The best place for speed, depth and wind displays is where the entire crew can see them at almost any time, and that location is above the companionway. The displays are out of the crew’s way and in the helmsman’s line of sight without being intrusive. A great number of boats were built with provision for cabintop mounting, which makes retrofitting a no-brainer. 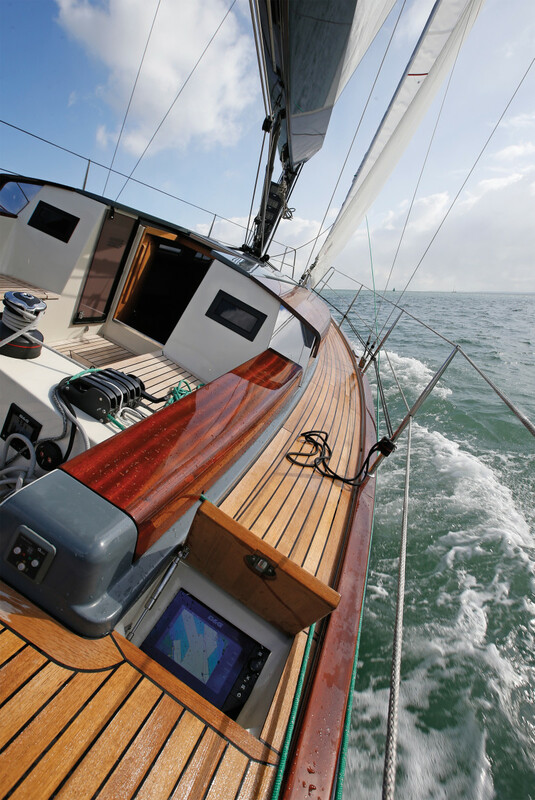 If not, you can buy instrument pods that will span the companionway and provide a professional-looking installation. Assuming it is not too difficult to run transducer cables to the new location, this is a good way to go. On my previous project boat, I installed Tacktick (now owned by Raymarine) wireless instrument displays to get around the cable issue. It is gratifying to see a number of production builders still placing function ahead of form by installing instruments above the companionway. There are so many mounting options available for instrument retrofits, from classy molded pods to basic metal brackets, that it should be possible to find something that suits both your boat and your budget. If not, you can draw on your sailor’s inventiveness and make something that will fulfill the required purpose. On our Norlin 34 project boat, there wasn’t room for pods to hold the small Standard Horizon plotter and Vesper AIS display I wanted to mount at the helm so I bought a pair of simple Edson pedestal brackets, and adapted the mounts so I could swivel the displays to either side. The previous owner had already made a swiveling mount for the autopilot control out of plywood, which is still going strong more than 15 years later. Many other sailors have come up with custom mounts to suit their own boats. It can be a daunting prospect to relocate instruments from the cockpit bulkhead because of the holes left behind by the old displays, but perhaps these present an opportunity to install cockpit speakers or a small portlight. I haven’t mentioned mast-mounting, which is traditionally the province of racing boats. There is no reason why a cruising boat couldn’t have its readouts located under the boom, assuming there is no reefing winch to get in the way, or a dodger to block the view. I’ve seen this setup on some performance cruisers. It would be easier to use wireless displays, though, than to run transducer cables all the way up to the mast, unless it’s keel-stepped.